Chromium has several functions and health benefits. As a trace mineral, Chromium is an essential nutrient that your body needs every day. The term "trace" means that Chromium is a mineral that's found in the body in very small amounts (less than 5 grams), which may make taking a Chromium supplement especially important. Chromium serves to potentiate the effectiveness of insulin, the hormone responsible for blood sugar control. Chromium also plays a role in lowering total cholesterol, LDL cholesterol and serum triglyceride levels and improve the LDL to HDL cholesterol ratio. The main symptom of chromium deficiency is glucose intolerance, characterised by raised insulin and blood sugar levels. The best food sources of chromium are meats and wholegrain products, however the refining of grains removes this important mineral. Using aluminium cookware lowers chromium levels in cooked foods. GTF (Glucose Tolerance Factor) Chromium is derived from specially grown yeast cells. 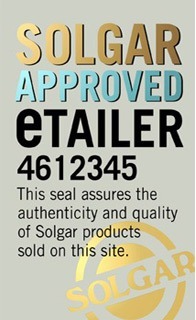 Solgar offers three different chromium supplement products dosages: 100mcg, 200mcg and 500mcg in capsules or tablets form depending on your need or suspected chromium deficiency.